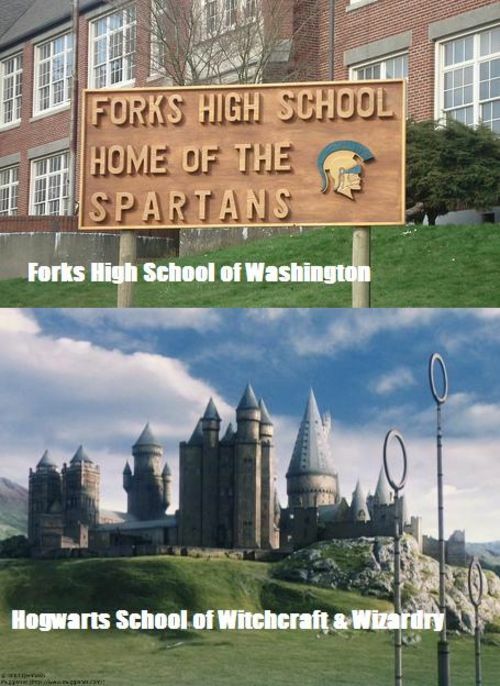 Hogwarts vs. Forks High. . Wallpaper and background images in the 哈利·波特与暮光之城 club tagged: twilight edward cullen bella swan harry potter twilight series funny. This 哈利·波特与暮光之城 fan art might contain 商务区, 市中心, 商业区, 商务区市中心, 街道, 城市风貌, 城市环境, 城市场景, 城市设置, 学校, 校舍, and 学校校舍.